Let us tackle even an oversized window at your Collingwood home or business with our custom-fit window shades. If you are looking for window coverings for your Collingwood, Ontario home or business that will provide both function and beauty, here at Ashtons Blinds, we pride ourselves on having plenty of options to choose from. One that you may not have thought about is window shades. The versatility of this style of window covering makes them an ideal solution for various needs. We have more than 15 years of experience, so you can be confident that we can come up with the right option for even a nonstandard window size or shape. Our window shades can be custom fit, so they provide the privacy, sun filtering, energy efficiency, and other benefits you are hoping to achieve. 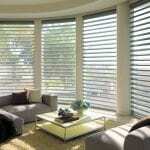 We offer top-quality products from trusted brands, including Hunter Douglas and Sun Glow Window Fashions. Our expert installation ensures that you’ll love the results of your new window shades. We offer a variety of styles, including blackout, cellular, roller, panel track, and Roman window shades, so you can get the appearance that best fits your décor while getting the benefits that mean the most to you. Whether you are looking for total privacy for a bedroom, complete sun blockage for a nursery, or a solution for an oversized window or sliding glass door, you can count on us to have the answer. We also make it convenient for you by bringing samples of our window shades right to your home or office. Our on-site free consultation ensures you have ample information so you can make the right decision. This process allows you to best match colours, textures, and styles to other components in the room, such as cabinetry, wall colour, flooring, and overall décor style. Contact us today to schedule your consultation and get the answers to any questions you may have.